It is now easier than ever before to copy a full page of your survey. You find a new Copy-icon at the top of each page when you are in the edit mode of your survey. A new survey template has been released: Paper. You will find it when you go into the edit mode of your survey and navigate to Design Template. What does it mean for you as a Netigate user? You now have access to a template that is as simple as it gets. No colours, no background, no transitions, no click/hover effects, no shadows – just black and white. Simple checkboxes, radio buttons and slider mechanisms. You can give your survey a minimal design; ideal for organisations that don’t identify with fancy designs. Create recognition and trust with branded URLs. 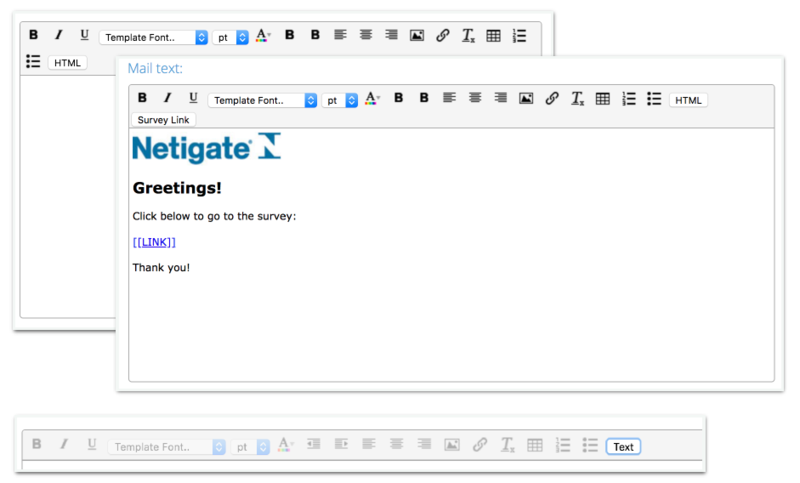 Netigate introduces the possibility to customise your survey URL. 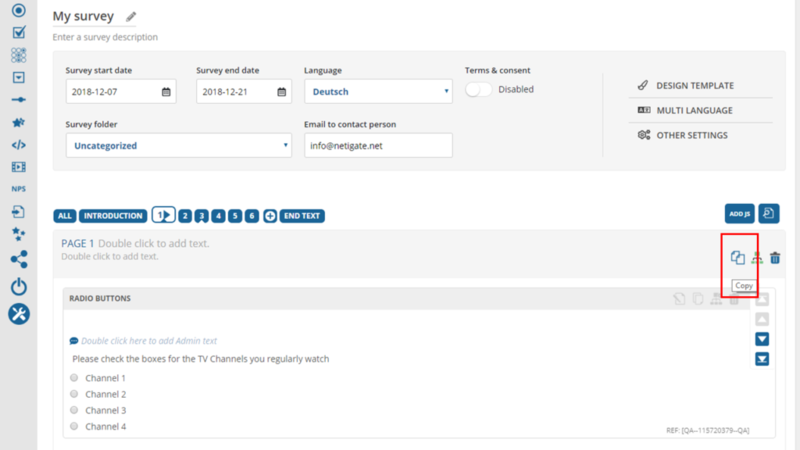 Your survey link will consist of 2 parts: One brand-segment (here you can choose text freely, e.g. mycompany) and one purpose-domain (here you can choose from a selection that Netigate provides you with. Now you have the option to increase brand visibility as well as answer rates by choosing a survey link that is individual to your company. Contact your Netigate account manager for more information. 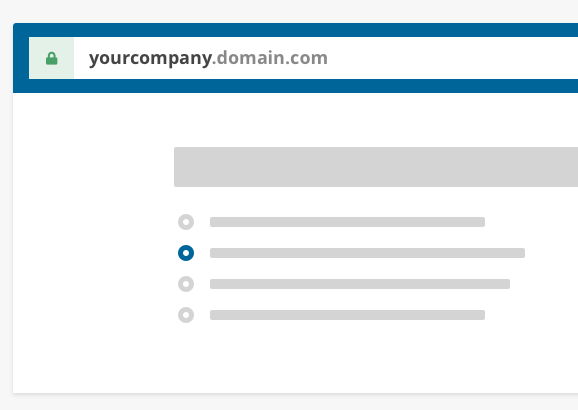 Note: Branded URL is a feature for general links as well as autogenerated links in email/SMS send-outs. 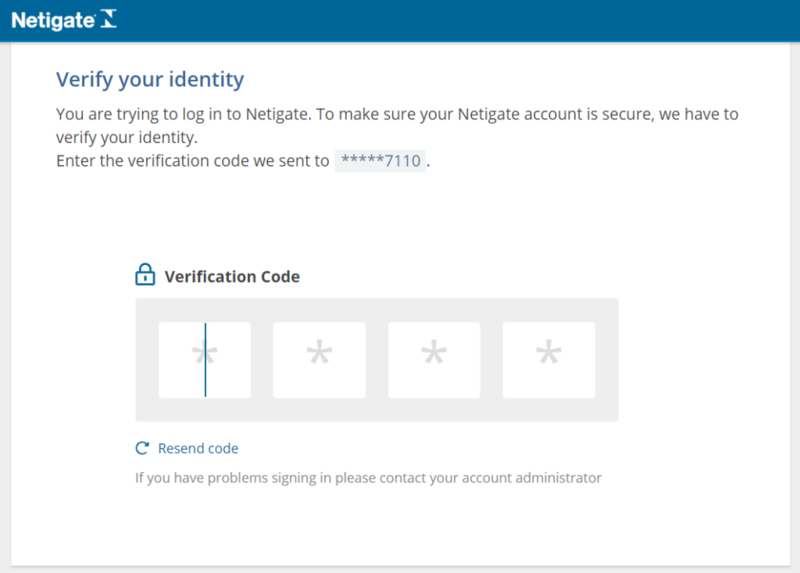 Netigate introduces two-factor authentication. The feature adds an additional security layer to your account. Enable the feature, add phone numbers for each user, and with each login attempt, they will be prompted to add a verification code which they receive via their mobile phones. Protect your account from cyber attacks! You can add an extra security level to protect your Netigate account from outside attacks. Contact your CR person at Netigate for further details. We have introduced a new feature for the question type Matrix. You can now choose how the Matrix shall be presented to your respondents. When you check the box Classic Layout, respondents will see the whole matrix as one big table. If you leave the box unchecked, the matrix will be dynamically presented. This is a new function in your survey settings and will include a confirmation of consent in your survey. At the start of the survey, the respondent will be prompted to consent to the terms of your survey. Note: If you have sent a survey with an identifier (e.g. Login or E-Mail send-out), respondents have the option to go back into the survey even after they have finished the survey. You can, therefore, have fewer answers today than you had yesterday. In line with GDPR you are collecting respondent´s consent that you work with their data. We recommend that you write a clear message, why you are collecting their data and how you are going to use it. 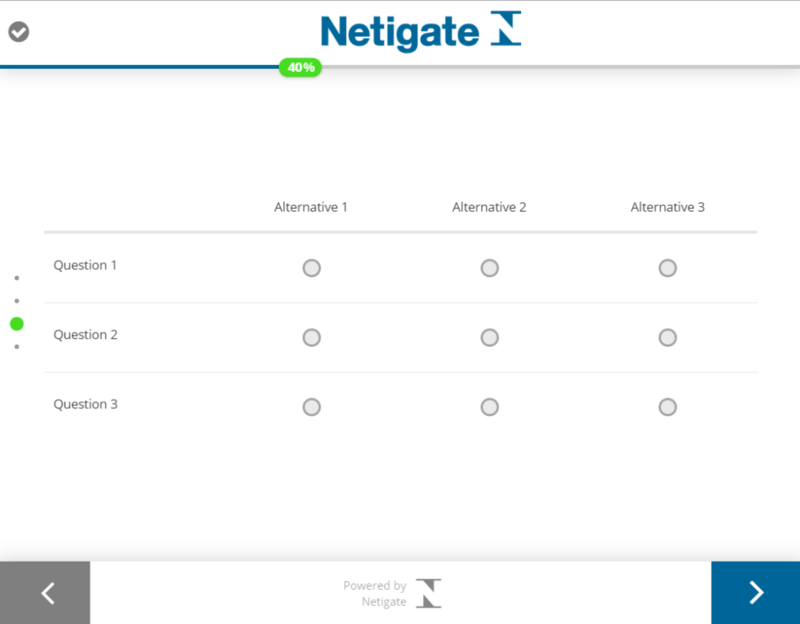 In line with GDPR, Netigate has introduced the new administrator setting called Data Retention. You can find them in your account settings as well as in your survey settings. They allow you to set part deletion and full deletion dates for data you store through your surveys. With this function, you are in control of the data you store of your respondents. Part deletion or full deletion allows you to conduct surveys and determine the timeframe after which chosen information will be deleted. Read the support articles to avoid deleting data you didn´t want to delete. Note: Data deletion is irreversible! 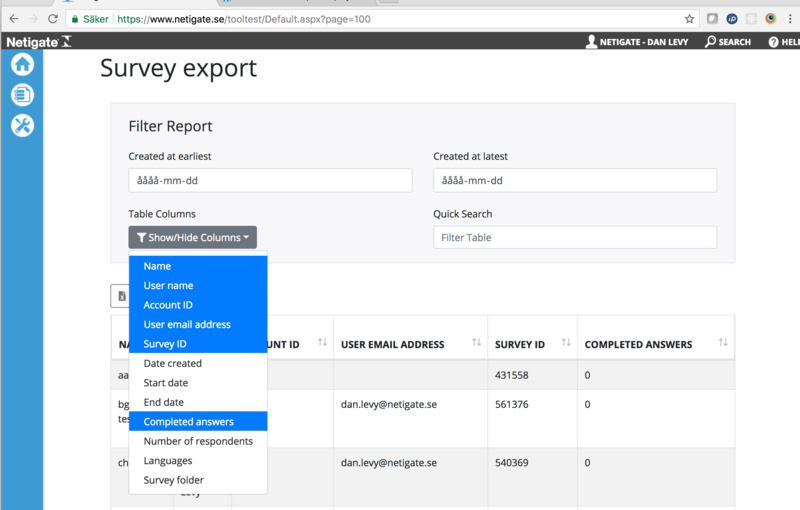 Survey export is a new page where administrators can see and export lists of all conducted surveys. It is possible to filter the list and choose which columns to show. Columns are movable and sortable. The list can be exported to Excel or as PDF. You have a great new way to get an overview of all your surveys and work with it or share it easily in different file formats. Note: This feature has to be activated. Contact your account manager for more information. A first version of Star rating questions can now be found in the Question meny. 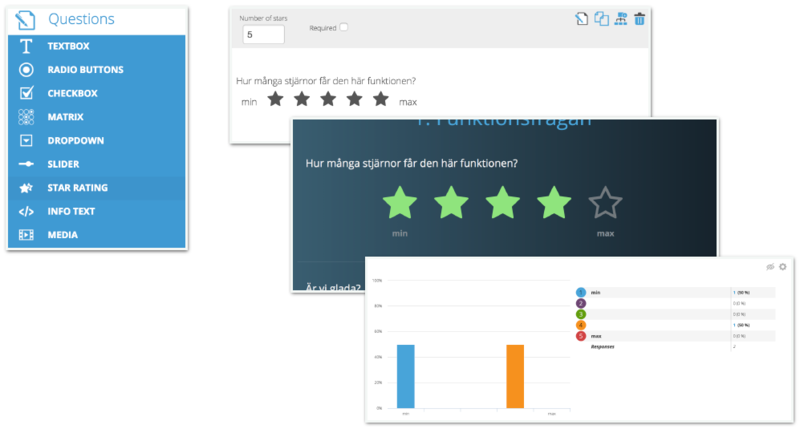 A star rating question is shown as a bar chart in the report section. Available settings: Scale, Required, Weight. You can start using this new question type and spice up your surveys. Simply drag and drop it in the creation part of your survey. The survey progress bar has been updated to show percentages also in text. This feature is optional for each survey – you can choose to activate it for a survey in your settings. It is now possible to let respondents choose if they want to use the survey link or go to a login page and use login credentials. At this point, it is done manually by adding custom parameters in the send out mail text. If you want to make use of this feature you will have to insert the parameters as described above. The feature gives respondents security that the survey is trustworthy. It provides respondents who are concerned about direct links with an alternate sign-in. To avoid errors and increase usability, text copied from external sources and pasted into the tool will now be stripped of HTML. This includes style and images. Also, when in HTML-mode, other buttons are now also disabled. The second phase will occur during Sunday the 4th of February 2018 to continue the migration of all our services on the Swedish Netigate server. This move will not imply any technical changes or implications for you as a user or customer, unless you have an email SPF record, Customized Solution or API. We do not anticipate any interruptions to our service, although there will be ongoing work the entire day and we strongly recommend you to not schedule any survey send-outs during the day for phase two. Response rates on surveys are always highest around the time survey invitations go out.